This line is essentially a reviving and expansion of the 400, which had been dropped from Pelikan’s production in 1965, and which had briefly resurfaced in the 1970s as an outsourced model. In its profile, it is very much a throwback to the original 400 with rather flat ends, a decision which is not entirely out of keeping with the somewhat retro trends which were appearing in the early 1980s, although it’s unusually true to the original. Similar to the 400, we find that this is a line rather than a single model. As there were various higher-numbered variants of the 400, usually reflecting some enhancement of trim, Souverän encompasses a span of models, the numbers reflecting both size and trim, which are linked to cost. The smallest regular production Souverän (which, for those uncomfortable with umlauts, is pronounced so close to “Sovereign” as to make no real odds) is the M300, which in earlier ages might be called a “lady’s” pen, while the largest “oversize” is the M1000. When in the same trim, there is little to tell from small to large in terms of looks when the cap is on, although the points become increasingly large and ornate. Functionally, there is also little difference from one step to the next. The M800 and M1000 have a brass rather than a plastic mechanism driving the filler, which is in theory more durable, but since the plastic mechanisms seem to be able to stand decades of service without degradation, that’s a theory which may never be proven. The brass mechanism is rather heavier, which depending on the user may either combine with the extra size of the pen and overwhelm or may be viewed as a comforting solidity. Sorting out just when since 1982 any given Souverän was made is not easy. Examples from before German re-unification probably have W.GERMANY as part of their impression, a distinction which doesn’t appear in many earlier models. Prior to 1997, there was no trim ring at the base of the false blind cap; all the pens shown below have a pair of them, and so come from after this small change of design. In 2010, the cap jewel bearing the company’s logo was switched from plastic to metal. My experience with the Souverän, which does not at the moment extend above the M600, is that it is a pen that has most of the virtues of both vintage and modern pens and few of the vices of either. Not too big (which I think only the M1000 can be accused of) nor extremely heavy, they are extremely comfortable pens to use; the weight of the M800 and M1000 is greater than the smaller versions by more than mere up-scaling, as the mechanisms for the pistons in those two are made of brass rather than plastic. The threads holding the cap are extremely positive and numerous, reducing the risk of the pen dropping out of the cap and into one’s pocket. Posting is a little tentative, perhaps, and one is probably better advised to leave cap to one side when writing. The main disappointment is the essential modernity of the points– they’re somewhat springy, but there is no flex to them, and they are extremely broad relative to their size indication. 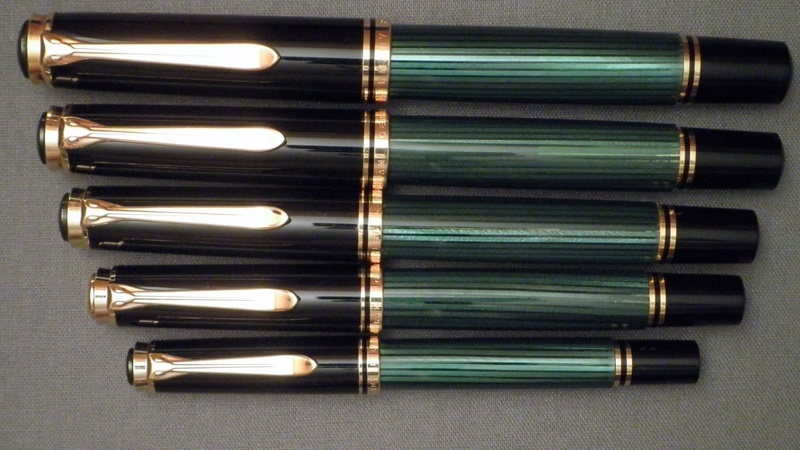 Pelikan points are also pretty uniformly wet, and one uses a wet ink in these pens at one’s peril. The Souverän is also the foundation of rather broad assortment of limited and special editions. These appear as uncommon colours, overlays, and even slightly different shapes; the vexingly numbered M101N combines two of these aspects, offering a lizardskin plastic and a silhouette reminiscent of the company’s earliest pens. This also excuses the name, which is an anomaly in the otherwise orderly system. If one looks at sites selling Pelikans, one will also see pens bearing numbers below M300 apart from that disruptive special edition. Pelikan apparently feels that those are insufficiently grand to apply the name “Souverän” to, despite their general similarity in shape, so pens bearing model numbers M100, M200, and M250 are referred to as “Classic” in the current Pelikan catalogue (not to be confused with the New Classic, which is a different sort of thing altogether), and previously as “Tradition”. I haven’t missed them, but they don’t belong here. One more point of interest about the Souverän is that the points can be unscrewed in a manner similar to those in an Esterbrook. The interchangeability is a little odd, though, as the M300, M800, and M1000 points will only fit in that model of pen, but the M100, M200, M400, M600 and M700 will all trade around with relative freedom– the lesser points are more likely to fit in the grander bodies, as there are issues of inner cap clearance attached to putting a bigger point on a smaller pen. Production Run: 1982 to present; some variants, even if not technically limited editions, have shorter runs. Cost When New: Current (early 2013) MSRPs run from $305 to $775 for the standard editions. Pelikan raised its prices substantially in 2012, so some variants below may seem extremely off their mark. Update: 2016 prices start at $375 for the M300 up to $1,035 for the M1000, and there are some maki-e limited edition M1000s which are suggested to sell at $4,500. Point: 18K gold on the M800 and upward; less expensive members of the line use 14K. Body: Plastic and celluloid (acetate). Filler: Piston, capacity varies with size; see below. M400: Cost when new, $305. Size,12.4 cm long capped, 14.5 cm posted, 12.1 cm uncapped. . Capacity 1.2 ml. Pelikan M400 in White Tortoiseshell; the mechanism ‘s share of the space in the barrel is easily seen. The M600 in blue, showing the capped proportions. There’s also a red before one has to start to consider limited edition colours. Earlier Souverän models did not have the bands on the tail. M 605: The same size as the M600, the M605 is a solid colour variant with rhodium plating which was apparently made for export markets only. To my eye, it is a little less appealing than the various striped versions of the Souverän, looking a little too much like a Wality for comfort. That’s a purely subjective opinion, though, and one which has no bearing on the performance of the pen. Cost when new approx. $275, production ran approx. 2005 to 2010 (before the price hike), dimensions the same as the M600. The whole family: from top to bottom, M1000, M800, M600, M400, and M300. Note that the M400 is a more recent version, with the metal jewel (image lifted from here with permission).